The problem is, that the “fumes” from the onion cutting rise up into the air and surround you in a cloud, nearly impossible for your eyes to avoid. So, you have to ventilate the area to prevent that. Here’s how! Simply, cheaply, and very effective. Go to Wal-Mart or Amazon and buy this little 4″ blade diameter electric fan that runs on 110V and has 4 metal blades. There are many choices, just be careful you don’t accidentally pick a USB powered one. 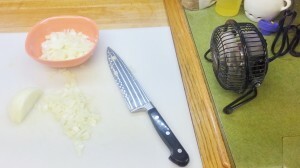 Now, set up your cutting board so that the fan blows across the work surface, and then towards your range exhaust hood. Turn on the little fan and the stove exhaust hood, and chop away on as many onions as you want. I set the fan a little closer to the cutting board than usual, just to get everything into the picture, but you can back it off by a foot or so, and it still works great. Angle it ever-so-slightly downward. You are trying to set up a laminar flow across the work surface that won’t be all scattered by your knife and onions. When I make a big batch of spaghetti sauce or my famous hot chili (with chocolate powder as one of the ingredients!) I have to cut a whole mess ‘o onions. This trick saves me a bunch of tears.